Early in Far Country: Stories from Abroad and Other Places, Timothy Kenny’s collection of essays about his time as a journalist in conflict zones, he recalls a conversation with an Afghan colleague in which a seemingly benign comment on Kenny’s part brings the conversation to an abrupt halt. “It is not the first time I have been chastened by not knowing what I do not know,” he reflects, offering a succinct encapsulation of the feelings of many who cross borders. In reading about Kenny’s own struggles to adapt, I remembered time I spent in Taiwan, asking cultural questions of the one person among my colleagues who seemed most willing to talk about practices and traditions that confused me. I continued asking for explanations over the weeks that I worked with her, especially about the very public religious displays I passed on my way into work. Why the tables full of fruit and incense outside the stores? Why the big barrels of fire in the alleys? Eventually, she countered, “You ask a lot of questions.” It wasn’t unfriendly, but it didn’t celebrate curiosity, which she claimed was welcome. Sometimes trying to remove cultural ignorance is an alienating task, especially for those who do the explaining. Far Country gives a sense of the burden cross-border connection places on all parties. 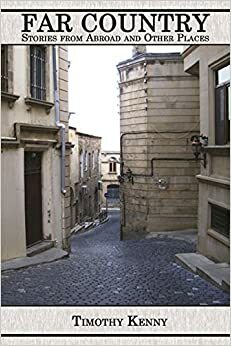 The book’s centerpiece, a long essay on the author’s time in Kosovo’s capital, gives keen insight to the difficulty of short stints living abroad. His description of the wandering, listless feeling and weather that never seems to be quite right was instantly recognizable after my own time abroad. His description of his relationship with his Kosovar landlord is a perfect example of the alienating differences that separate an expatriate from both home and the place where he finds himself. Despite the temperature, his landlady refused to turn on the heat in his apartment, saying, “It is not time to turn on the heat in Pristina.” Kenny faces the frequent question of many who make their homes abroad: Am I being taken advantage of or do I simply not understand? Far Country is a brief book, but even so its final section, a reflection by Kenny on fatherhood, feels flat after the snap of the rest of the book. Though the stories are riveting, the essays sometimes struggle to keep the reader grounded in a particular time. In trying to cram a lifetime of stories in a short space, it’s sometimes difficult to tell “when” we are on the timeline. Kenny also has a penchant for similes that zoom wildly from one frame of reference to another. Even so, images from Far Country and, more importantly its moods, stick with me. Though I’ve never lived in a conflict zone, the difficulties and rewards of foreign life that Kenny describes are familiar to me, or at least as familiar as these sorts of things can be. Travis DuBose‘s fiction and nonfiction have appeared in Cleaver Magazine, Petrichor Machine, and Apiary. He teaches at Rutgers University-Camden where he manages the university’s Writing and Design Lab.